I always thought that coffee is best to wake up with but nothing works as intense as a snake rescue call. Today at 8:00 I was woken by a phone call, a local villager had a King Cobra at their house. On the arrival we were directed to the back of the house and found the animal sheltering between stairs and the space beneath the house floor. With only one entrance to its chosen shelter we decide to block it with our PVC pipe connected to a snake bag. Then with some gentle encouragement the snake moved to our trap and our work was done. This is 4th King Cobra we rescued within 2.5 weeks. We released it about 500 m away in forests of Sakaerat Biosphere Reserve. This was really peaceful and patient individual. Few days ago we received an emergency call from our friends at the local Rescue Team. Villagers had noticed a BIG King Cobra at the side of a field margin whilst cropping sugar cane. With the snakes’ safety as well as that of the local community in mind, Mr Mee หมี กู้ภัยอุดมทรัพย์ อ.วังน้ำเขียว, of the Rescue Team, contacted us to help remove this magnificent animal. On arrival we realized the snake had a massive bolus. It was so big he could not fit into his burrow. Considering this, we had to evaluate if it would be safer to leave the animal. Unfortunately, fear of the snake was evident and very strong among the villagers. We don’t blame them, it was big individual. However, handling snakes with a big bolus is always a delicate matter because it’s easy to hurt them. Whilst we were contemplating the best solution for both snake and villagers, the snake decided to regurgitate its meal. It was no surprise to us that it was a Burmese Python. Once the King Cobra had rid itself of the Python, we attempted to capture it using the tube method. The snake was so large he could not fit into our standard pvc pipes. Therefore, we had to manually place him in the bag. Luckily, it went smoothly and we were soon on our way back to the station. On return we gave this huge male a quick shower, cleaning faeces and digested python parts from his body. This way we don’t need to worry about flies laying eggs on him whilst he waits to be processed for biometric data. After showering, we presented the snake with a larger pipe and this time he did not hesitate to enter. He now has time to settle down after what must have been an unpleasant experience. The King Cobra is 6.5 kg and the Python, partly digested, is 5kg…. Now that is a big meal! Thanks to the great work of the rescue team and cooperation of the villagers, this majestic creature lives to see another day. While processing we collected measurements of this snake. He is 3.55 m total body length and weight 6.5 kg. What is interesting this not first time we meet this individual. In April 2018 this male was rescued from villagers house. Since last encounter this snake grown 15.8 cm and gain 1,58 kg. 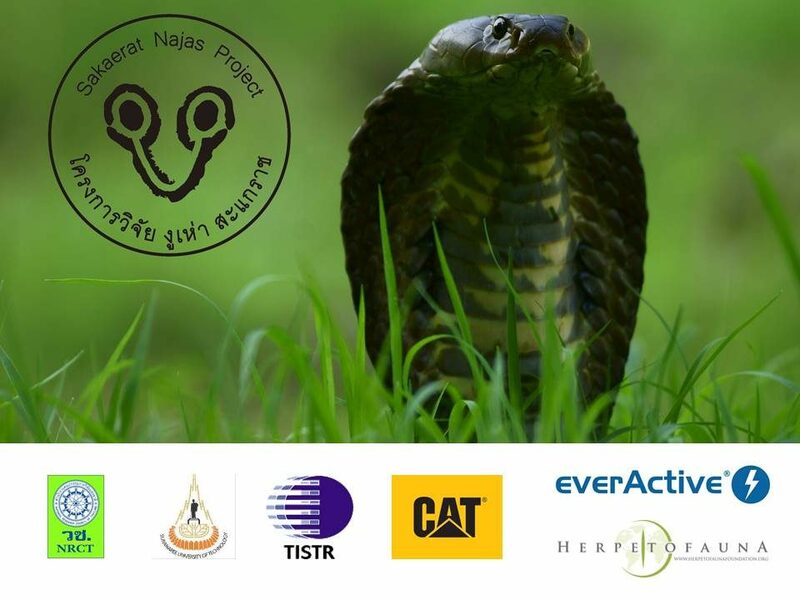 Very impressive growth rate and some cool data for #sakaeratconservationandsnakeeducationteam. It has been quite a snaky time for our project recently. Our team encountered number of Monocled Cobras (Naja kaouthia) during their radiotracking activity at Sakaerat Silvicultural Research Station. Unfortunately we didn’t manage to capture them all, but 3 will join our radiotracking project. This is very exciting for us as it will bring our study sample to 5 adult males sharing home ranges in this area! Encouraged by the number of sightings we started to put more effort in to actively surveying the forestry plantations. It wasn’t long before we encountered another cobra… This time a juvenile King Cobra (Ophiophagus hannah). The animal was found crossing a dirt road on the margin between the Dry Evergreen Forest and eucalyptus plantations. The regal beast did not appreciate our presence at all, displaying the full range of its defensive behaviors. Of all the snakes we encounter in our study site, we consider the juvenile King Cobra to be one of the most difficult snakes to handle. These snakes are fast, strong and afraid of humans. Young individuals, of this serpent eating species spend a lot of their time in the trees, their long, slender and strong body allowing them to rise up and climb easily. This is a dangerous mix and as handlers we must always be extra careful while working with these animals. Additionally juvenile King Cobras don’t have the same confidence and sense of self assurance that a 3 meter plus adult has. Meaning they are often more willing to bite and envenomate (remember we are the ones who disturb the snake in the first place). Nevertheless we managed to capture it and bring it back for our friends from#SakaeratConservationandSnakeEducationTeam. They are radiotracking King Cobras around Sakaerat SERS. They processed the snake for biometric data and found it to be a 2.26 m long male in good body condition. After which, we happily released the snake back where we caught it to resume its life in the forests of Sakaerat. While ago we were live streaming a very special find… a baby Leopard Cat (Prionailurus bengalensis). This animals are very cryptic and not often encounter in Sakaerat SERS. Normaly our encounters are very brief as this animals move away as soon they notice our presence. Recent time we notice a baby cat hanging around Sakaerat Najas Projecthouse. We assume that youngster was waiting while its mother was hunting around the station. Very cool aspect of this encounter was not only long and peaceful visual we had on the this extra cute animal. Extremely close to it was sheltering Malayan Krait (Bungarus candidus). Possibly most venomous land snake in this part of the world. In fact, it is visible on one of the photographs. Can you see it? To be honest with you, we did not notice it until it decide to move out of its shelter and slider away passing by the cat like 5 cm away. Now that is not something you see every day. For sure it will remain in our memory as a one of most cool spot in SERS. With recent rains frogs become more active around the forest station. We took advantage of that and went to look for a very specific type of frog – a flying one. There is quite few gliding animals in Sakaerat SERS. You can find Paradise Gliding Snake (Chrysopelea ornata), parachute geckos and gliding squirrels. I have seen them on many occasions but this frog was on top of my list. On one of my recent night survey I manage to locate the breeding site of this interesting and beautiful animals. They have very specific call that resemblance clicking noise. In total I menage to see 8 individuals. This species is known as a Orange Webbed Treefrog (Rhacophorus rhodopus). It is rather small species growing of maximum 5.5 cm. Females are bigger than males. Front limbs webbing’s are yellow while hind are orange/red. It was really cool to see them gliding. Once they were tired of my presence they just jumped off spreading their toes and use some extra caring surface to extend their jump. Here I present you some of the photos I took with my Sony camera. Hope you like it. A good while back we rescued Burmese Python form the local villagers house. For the release we choose the irrigation chanel on the edge of the households area. As always we were trying to take some photo documentation of the animal, but it was shy. The Northern Pig-tailed Macaque (Macaca leonina) is the only species of monkeys we find in Sakaerat. On the video you can see big troop crossing plantation road. Sometimes we can find the very close to our radiotracked Monocled Cobras.